First celebrated in 1987, SXSW (South by Southwest) is a conference and festivals in Austin, TX, that “celebrates the convergence of the interactive, film, and music industries”. 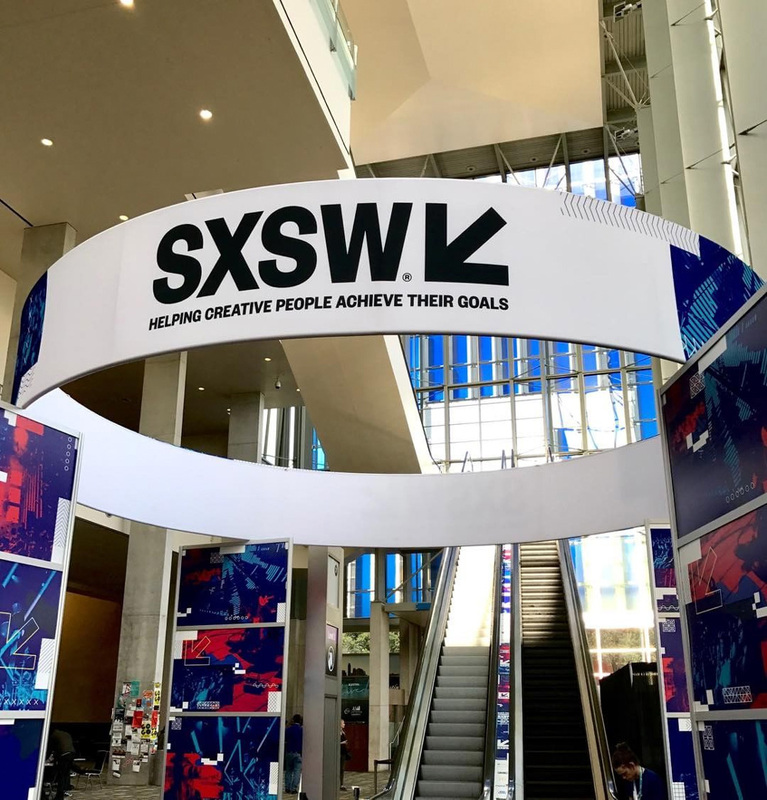 Originally only a music festival that attracted 700 attendees, SXSW introduced the interactive and film tracks in 1994, and now hosts over 72,000 registrants and artists. Perhaps apocryphal, but SXSW is one of the main reasons Austin has become one of the fastest growing cities in the last 10 years and it has been a giant boost for the economy and appeal of Austin as the place to be. 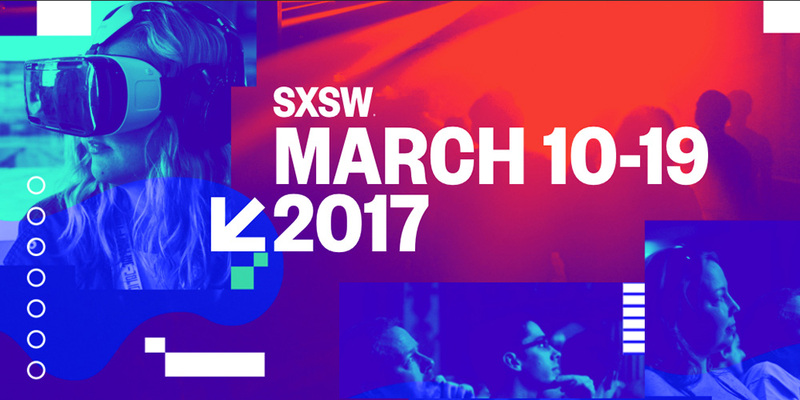 Every year, SXSW has completely reinvented its identity, with the last eight years done by the same firm, Foxtrot, who wiped the slate clean and established a master brand for 2017 and the years to come. 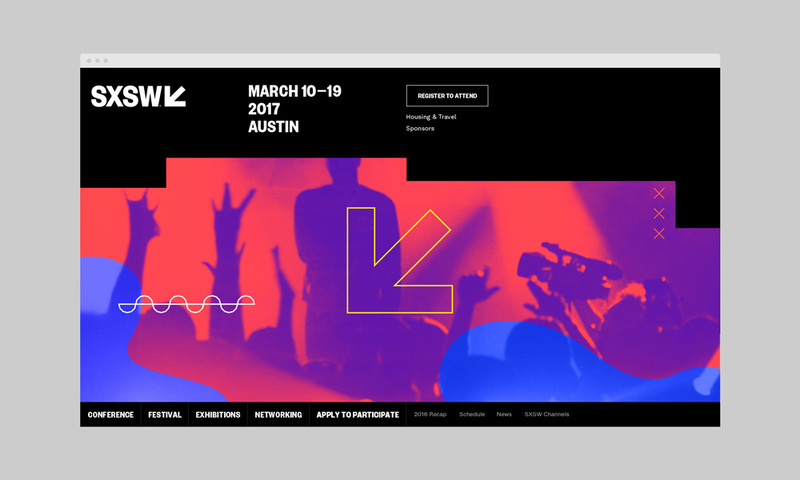 Foxtrot has worked with SXSW on a multi-year engagement as partners and collaborators annually re-imagining the conference visual expression, informing digital service experiences, and designing systems and interfaces for the SXSW ecosystem. 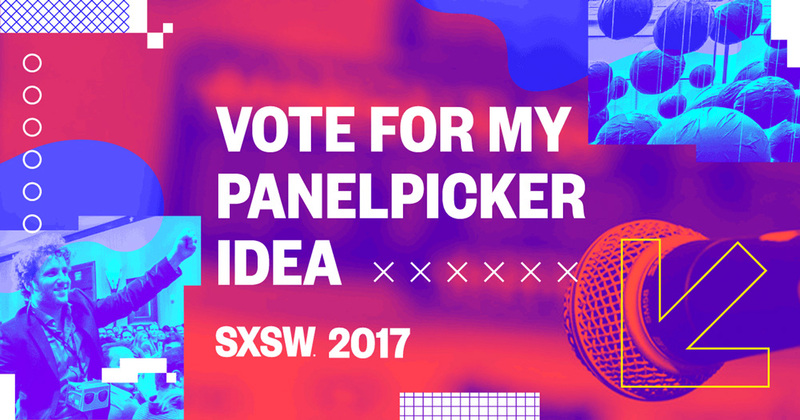 Always looking for ways to elevate the brand and improve their digital services for customers and employees, Foxtrot has been a strategy and design partner for SXSW for years, most recently unifying the brand and shaping the future role of digital services for the conferences and festival. 2009 to 2016 logos. 2009 and 2010, designed by Studio | Peteet Design; the rest by Foxtrot. 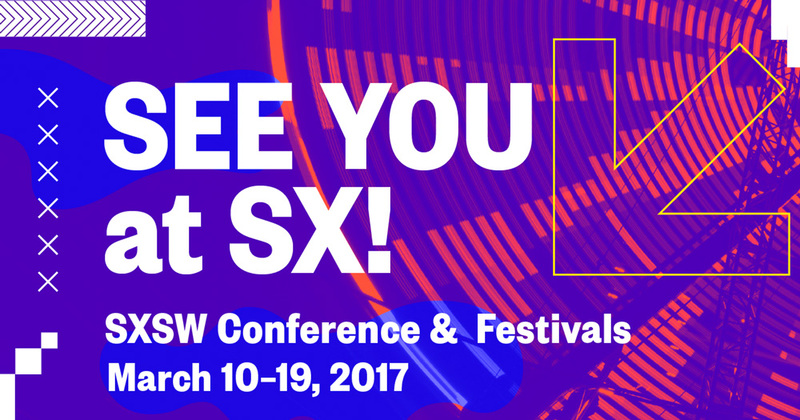 Hit or miss, I always enjoyed seeing how the SXSW logo would shape out each year, given that it was a semi-complicated puzzle to solve, having to give equal priority to its three attractions of Music, Film, and Interactive. Until I read the quote below, I had never realized that green was for music, blue for film, and orange for interactive but, then again, when SXSW rolls into town I do not venture further out than a 5-block radius from our house. 2013 was one of my favorite looks. The brand framework will not change moving forward. Instead, we’ve created a system where the core elements - primarily logo and typography - will remain constant, allowing for the atmospheric experience of the conference and festivals to take center stage. e.g., photography, video, and other key art elements. Gone are the days of a limited palette of orange, blue and green signifying the three silos of interactive, film and music. The new logo is surprising in no way whatsoever, revolving around a hip, deadpan sans serif. 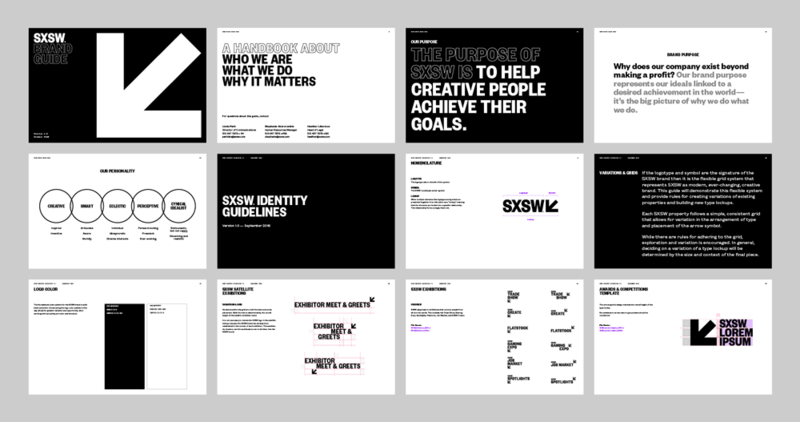 But that’s not entirely a bad thing as it allows for full flexibility in extending the main logo into the dozens of official things happening at SXSW (see below) while also allowing each year to introduce a graphic flavor (more on this at the end of the post). This new system is more akin to having the Olympic rings with the Look of the Games changing every year. The most graphic thing about the logo is the introduction of a blunt arrow pointing, you guessed it, Southwest. When I first saw the arrow pop up in tweets and Instagrams it didn’t register as being “new”… it seemed like something obvious that had been there forever and was instantly recognizable. 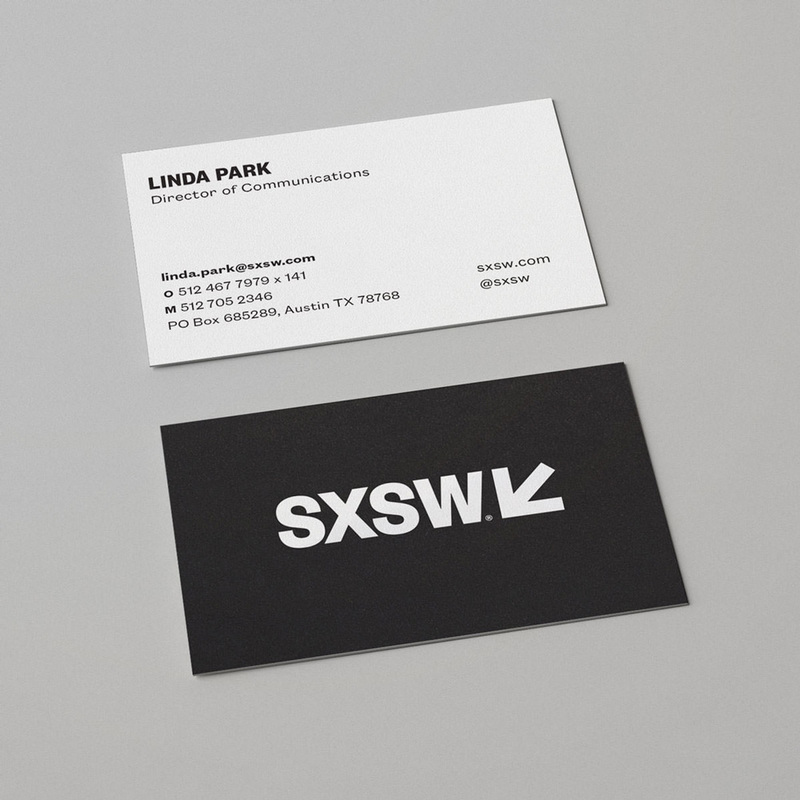 The combination of the somewhat condensed sans serif with the squared arrow makes for a solid recognizable logo that works perfectly well for the SXSW brand. Framework for building logos for the different facets of the event. Another option for various things. The biggest improvement in the logo is its increased functionality as a system that gives the event’s graphic department a clear, consistent, and strong foundation to build out the multiple communications needed and to do it consistently year after year. The corporate/institutional applications are a little dry but they do look commanding, especially that letterhead. And some more of it. Promo video for 2017 event. This year’s identity had a Spotify-ish approach with a mix of blue and red duotones. These came together in blobby-and-angled collages with various graphic doodads. Why? Because Southby. The event does have the flexibility to do whatever it wants graphically in part because it encompasses so many disciplines that it doesn’t have to hit one in particular — meaning it doesn’t have to have guitars to signify music, or film strips to signify music — and can have any visual expression it damn pleases. This year’s look was trendy but well done. For the last 4-5 years SXSW has become a global powerhouse event and it makes sense to establish a consistent, recognizable logo, instead of a visual moving target. This is a very appropriate and cool-looking platform for the next 4-5 years. First celebrated in 1987, SXSW (South by Southwest) is a conference and festivals in Austin, TX, that \"celebrates the convergence of the interactive, film, and music industries\". Originally only a music festival that attracted 700 attendees, SXSW introduced the interactive and film tracks in 1994, and now hosts over 72,000 registrants and artists. Perhaps apocryphal, but SXSW is one of the main reasons Austin has become one of the fastest growing cities in the last 10 years and it has been a giant boost for the economy and appeal of Austin as the place to be. 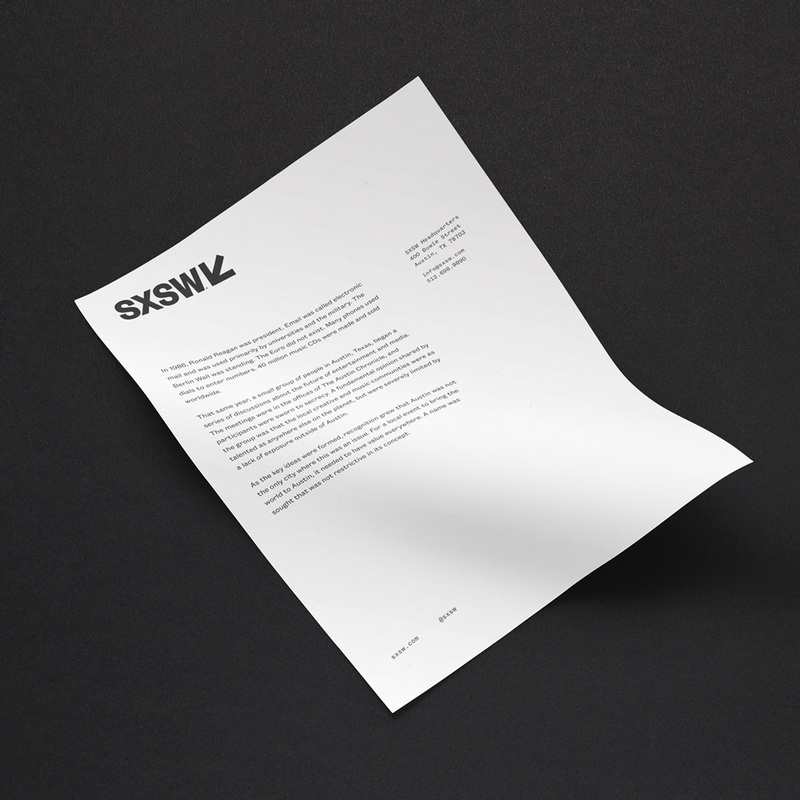 Every year, SXSW has completely reinvented its identity, with the last eight years done by the same firm, Foxtrot, who wiped the slate clean and established a master brand for 2017 and the years to come.